By now (the year 2014), your Perioperative Department no doubt performs all of the Surgical Care Improvement Project (SCIP) measures at 100% or almost 100% the majority of the time, and the SSI rate for clean surgeries is below the national average of 2-3%. Go ahead, but now is also the time to lower the bar, change the culture, and set your sights on the ZERO percent SSI rate. 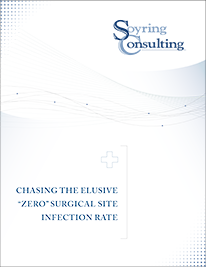 Download today so you can bring your surgical site infection rate down to zero -- and keep it there!